You are currently browsing the MSBLOG weblog archives for August, 2006. Virtual Server 2005 R2 SP1 BETA2 is available for download! Note: A product key is not required for this release. Windows Vista will be supported as a guest OS when Virtual Server 2005 R2 SP1 becomes generally available. Virtual Machine Additions forÂ a Vista Beta 2 Guest OS are available for download. If you are not running Windows Vista Beta 2 as a guest, you do not need this version of the Virtual Machine Additions. Posted in Beta News, Virtual Machine, Windows Vista | Comments Off on Virtual Server 2005 R2 SP1 BETA2 is available for download! Windows Vista – pre-RC1 – 32-bit only. There are NO planned downloads for x64, and you better hurry up because once the 100,000th person begins their download, they’re closing it straight back down again, so hurry!! I found the download link… http://g.live.com/0HEWL_ESSENTIALSENUS9/126001Â but that’s it. There’s nothing on there, no download, no information, absolutely nothing. Still, as soon as it comes into public beta no doubt there’ll be software there to download. There have been a few posts on the web about all the Windows Live services (Mary-Jo at Microsoft Watch, Matt Mondok at M-Dollar, Yahoo!, even Microsoft PressPass) and how many there are and which are actually services. Well, in a joint effort from myself and Chris from LiveSide, we’ve managed to make this list. It’s categorised to the best of our combined knowledge, by project start date which essentially means when the service was thought of, it gets listed; essentially it also means that this list is “in order of Live services” well and truly. Here’s what we’ve come up with so far, and hopefully I’ll keep updating this as soon as new features and releases come out. Part of a bigger picture, link goes to Live Mail but will integrate your contacts in Mail and Spaces together. The new web portal for Windows Live – the homepage if you will. The new MSN Search, with added features for searching for news, images, academia and feeds. The rebranded MSN Messenger with integration with Live Spaces, interoperability with Yahoo! as well as free VoIP and video calls. The central site reporting on what’s new, what’s coming and what’s already out – just had a facelift on the site as well. The rebranded MSN Hotmail – better interface, easier to browse contacts, and no page refreshing as well as advanced spam protection. Enabling you to access your favourites from anywhere in the world using this simple web interface – gadget for Live Spaces too. New competitor with eBay – buy, swap and sell products and without any costs to the users at all. The brainy guys workying on new products and advanced technologies to make Live products better. The one stop place for computer protection, anti-virus and advanced firewall. Online scanning facility for checking your computer for viruses and cleaning up unnecessary files. Allowing you to have your own domain name to use with Windows Live, Mail and Messenger. Enables you to call businesses for free after searching for them in Live Local. 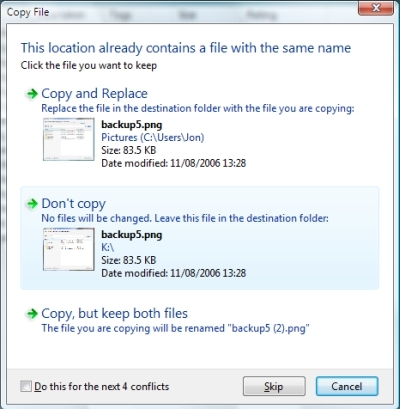 The free desktop application allowing you to search files on your computer, the web, Messenger sharing folders and your Live Drive. Imagery of San Francisco and Seattle, allowing you to navigate the map with a variety of views at street level. A toolbar which adds itself to Windows Explorer and Internet Explorer, allowing access to your Space, Live Mail, and Live Favourites and search everywhere you go. Enabling you to see your Live Mail, other POP3 and IMAP folders as well as RSS feeds and other email addresses and contacts on your desktop. The new and improved MSN Passport – working seamlessly with Live services and allowing multiple sign-ins with different accounts. Â Enabling you to write, post and modify blog entries in real time with loads of customisable options like adding pictures and Live Local maps embedded into your entries. The central point to change, modify and create new Live ID’s and settings. Â Allowing you to set and manage options and viewableÂ content for younger users’ Windows Live ID’s. Enabling you to cut, copy and paste information from one website server to another ideal for moving calendar or contact entries between accounts. The new Marketplace enabling you to buy and download software straight to your Vista machine. Ask questions, get answers, vote on answers and earn kudos points which earn you special rewards. Â Send information updates to your email inbox, mobile device or Messenger. The world’s biggest social networking site, letting you blog, add photo’s, customise content and add gadgets. Allows you to search the web for academia – books and journals from different authors and relevance. Enables you to search the web for specific images, of different sizes and preview panes. Enables you to search the web for products to buy using Windows Live Search. A new feature for Live Mail and Messenger for leaving voice messages for other people for when they are unavailable. Â Allowing you to create custom 3D galleries of photos and media and send it to other users across the Internet. Will eventually become a Windows Live service. 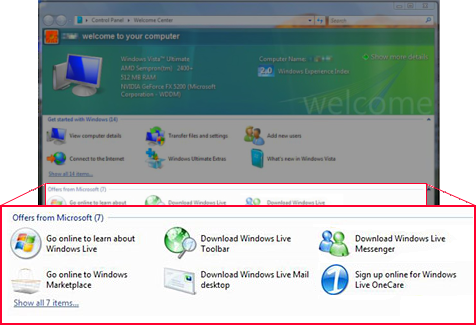 The easier way to signin and out of Windows Live using a simpler interface and advanced security. Downloadable software for easy access to wireless networks on your laptop or mobile device. Web interface allowing you to search hundreds of thousands of free or paid wireless hotspot locations in over 90 countries. The development center and supplier of software developmnet kits for Windows Live developers. The central place to browse, submit or apply gadgets to Live.com or to Windows Live Spaces. The revamped MSN Hotmail for Mobile but brought to a mobile device. The revamped MSN Search for Mobile but brought to a mobile device – mobile compatibility integrated. The new way to buy books – searching millions of books and able to buy them online using an online preview pane. A dedicated team to help aggregate information around the Internet – just how RSS is part of Mail Center. Part of Essentials but lets you see what you have installed, what’s on offer and other links for support. Note 1: MSNÂ Video (codename “Warhol”) is an MSN service and not a Windows Live service. Note 2: Some haven’t made the list because they’re not exactly services – Windows Live Help for example and SDK’s aren’t really services. Also, some “services” merged into the larger umbrella service, such as Windows Live Near Me Search was absorbed by Windows Live Local. Note 3: Xbox Live and Office Live aren’t actually Windows Live products, so they’re excluded from the list. They’re different teams, different way of thinking and they just generally don’t have anything to do with Windows Live. Windows Live Essentials and with it comes the complimentaryÂ Windows Live Dashboard. Windows Live Essentials is basically the Microsoft equivilent of Google Pack and we saw this coming ever since that last message in the installation of Live Messenger saying “Please note, there may be other installations in progress” or something of that effect. It’ll let you select the services and applications you want to install and highlight the main ones, Messenger, Mail Center (it’s still called Mail Desktop and will be called this eventually), and Live Toolbar which comes out before Christmas. Windows Live Dashboard is the interface given of which lets you see what’s on offer, what you’ve already got and are using, as well as the opportunity to download and install new ones that come along once they’re finished. The Live Essentials beta will begin in the next couple of weeks – and just to clarify, there are now 45 Windows Live services, even though Dashboard is a service hiding within Essentials. Edit: Just noticed, Chris has posted just after this, go and see his post as well here. That’s right, this will be the 43rd service being provided by Windows Live, and yes there are some you won’t know about because they’re super duper top secret. However, this is the 43rd. The service will begin beta this week, and only Windows Live Butterflies will have access, but eventually you’ll be able to see it at https://fss.live.com/. Just thought I’d share a little love and tell you guys how well you’re doing in keeping us up and going 🙂 Obviously not all the hits will add up to the overall count, but this is just a poi-pourri of statistics of which shine through the dark and misty haze of numbers. Windows has come under fire some time ago by the EU (European Commission) being theÂ executive body ofÂ allÂ the countries in EuropeÂ which has the right to initiate legislation and rules and stuff, because Microsoft put products in Windows XP which was making smaller businesses creating competitor products go bust. So because Windows XP came with Windows Media Player 9, it was making it difficult for Nullsoft to sell Winamp because people were using a product which was readily there. So the EU got all stroppy about this and had a major hissy fit and said to Microsoft, “look, take Windows Media Player out of Windows, or give consumers an option to have Windows but without all of this bundled crap in, or we’ll fine your arses off”. Microsoft did this but not quite in time to receive a good few fines amounting to millions of dollars (enough to fill the pockets of those EU snobs for a while), and created Windows XP “N” Edition, the “N” standing for No Media Player. This was basically called “anti-trust”. Now the same problem lies in Windows Vista, because that has Windows Media Player 11 bundled in, but because Microsoft learnt their lesson from getting smacked on the arse with a slipper from the EU, it’s decided to make preemptive strike by offering an “N” Edition of some Vista editions. They’ll just put shortcuts and links to their software instead of actually bundling the software in. Microsoft have learned their lesson, but they’re still looking for loopholes, and this stands a good chance of actually working. If you see the image below, you’ll notice from the wording what they’re trying to do. “Go online to learn about”… “Download”… “Go to”… “Sign up for”… it’s all linking to complimentary software which won’t actually get bundled in to Vista. Windows Vista won’t have Windows Live software bundled in, but instead to get around the legal aspects and the anti-trust stuff, offer free downloads or links to the complimentary software and services instead. It seems that Microsoft is getting ready to launch RC1 anytime soon. However at the moment the link gives “The Customer Preview Program is now closed.”. However do stay tuned as it’s going to be launched and order RC1 before it really closes!! !